Rockstar is hoping that L.A. Noire will be both a fun game and a compelling cinematic experience. Rockstar and Team Bondi had delayed L.A. Noire so many times over the years that when a new trailer for the game was released in November, it was called the game's "first trailer" despite Rockstar having given us a look before. The reason behind the repeated delays was apparently so that Rockstar can build L.A. Noire up to be the greatest cinematic experience ever seen in a videogame. By saying that L.A. Noire will be cinematic, Rockstar doesn't mean that it'll make players sit and watch for hours, Metal Gear style. Instead, its development process is using the same techniques, and actors, one would see in the production of a movie. 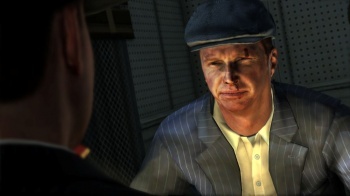 Using a technology called MotionScan, L.A. Noire can display realistic performances from seasoned actors such as Aaron Staton from Mad Men and the loopy genius inventor from Fringe. A recent trailer available here shows off the incredible technique. However, this technology isn't just being used to impress gamers visually. Team Bondi told the Telegraph that it's incorporating MotionScan with gameplay by asking players to analyze the faces and mannerisms of people they interrogate in the game. Players will have to remember these people's names and how they acted. Team Bondi founder Brendan McNamara said: "It is risky, but hell, Rockstar has been taking risks in this industry since GTA III." McNamara feels that L.A. Noire will truly be a landmark game that "blurs the lines" between videogames and movies. "I want this game to be the flashpoint where people start to think of games and film as being on the same level, because I'm confident they already are," he added. "With all our games... they've all been incredibly cinematic experiences, but it's been a challenge to be viewed as a legitimate medium." Videogame cinematics have been cool since they were composed of pixels, but L.A. Noire's look to actually express the nuances of body language during human communication. Heavy Rain was a great first step towards games that have the realism of movies, but it still had a major case of uncanny valley syndrome. Watching footage of L.A. Noire doesn't give me the same feeling at all, which is eerie in its own right.